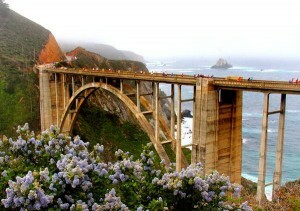 I have heard about Big Sur Marathon from running friends and never understand why all the hypes about this local race? Don’t we run in Monterey all the time? Pacific Ocean? Sure, big deal! But in April, two people were telling me about Big Sur again and that made me wanted to participate this race. First a business acquittance and someone I have lots of respect professionally was telling me how he had ran Big Sur twice and how inspirational the view had been for him. Then Mark told me when we had our carbo-load dinner for Paris that he wanted to run this race, but it got sold out too fast. So I did some follow-up research and discovered that Big Sur is not “just another local race” but a race famous for the support, very scenery and acclaimed international race! Thanks to my sponsor GU Energy Lab, I was able to register for this race two weeks before the event. Factoring in that I was in recovery mode after Paris Marathon, I let the GU and BSIM coordinator know that I would be running the 10.6ml instead of the Full or 21 mile distance. There are also Boston 2 Big Sur Challenge, 9 mile, Relay (5 people) and 5K race. Due to my very last minute race entry, I immediately started to coordinate with my running buddies about bib pick up and carpool..etc. Since it has several distance category and multiple start points, and the race is going to be point to point on Hwy One, the Full runners have to hop on the first bus at 4:00am from the Monterey Pennisula College, and Relay runners are sometimes between 4:20 to 5:00; for me it’s 6:00am from Fisherman’s Wharf, ..etc. So I handed Michael a copy of my ID on Friday and asked him to pick up my bib for me on Sat, he would then give my bib to the 3rd leg runner on Sunday morning and then give it to me at the College. Marcia and I met at my house at 3:00am, and promptly we embarked our trip in pitch dark; I love this girl for she is so punctual – a quality I like but seems hard to find nowadays! I opted the route of Hwy 17 then Hwy 1 instead of 101, because I thought the roads would be prettier and less boring, but what I did not anticipate was how windy and foggy both the 17 & 1 would be at 3:00 in the morning. At some points I was only able to drive at 40mph because I could barely see anything surrounded me! We got to the College around 4:20, and saw there were volunteers at site already. There is really no reason to whine about 2:30am wake up, because the volunteers were way ahead of us. The 10.6ml start point was at mile 15.6 of the Marathon course on Highway 1, and it’s a point to point course with one side of Hwy One shut down; we would finish at the Marathon Finish line near Rio Road. It was very cold and foggy when I crossed the start line, but the view ahead of me was just unbelievably amazing that quickly energized me. I jogged at an easy pace while holding my swag bag like a football with my right hand, and about half mile into the race there was a school bus on the left that runners could just hand the gear-check bags to volunteers. Thank you all for that truck-load of volunteers, literally! I had no timing goal for today’s race except I was going to enjoy this recovery run, scenery and famous course support. Each mile there was a special designed mile marker with tailored message from sponsors. The first one I came upon was at mile 16 and could not help but to giggle, stop and take picture with my iPhone which I found myself doing so often that my phone eventually ran out of battery right when I crossed the Finish line. There are several very famous spots along the Marathon course, for instance the super famous Grand Piano Man who each year plays piano at an un-announced spot. This year he was near mile 12, so I missed him. The Taiko Drummers near mile 5, the iconic Bixby Bridge at mile 13.1 which I missed on my course, hence this gives me a reason to sign up for the Full next year. I did come across the Keyboard Man playing keyboard, and I stopped to take a picture of him and requested a song. The Harp Lady around mile17 was playing beautifully, and she shouted out “you are doing great” when I finished taking picture and continued my run. And who would have thought that you will come upon orchestra band by the ocean? The very carnival and festive Samba band and dancers in vibrant costume were at around mile 21. Also the breath taking view was just non-stop, and lots of crazily beautiful houses nested in the cypress with the awesomeness of Pacific Ocean view and breeze. I simply can’t describe how much I have enjoyed the course, especially after the super crowded Paris Marathon with the packed runners and mile long dark tunnels. There were official aid-stations approximately every two miles with water, sport drink and separated hydration refill station, so runners can refill their own hydration pack or bottles if they choose to. I usually don’t like Gatorade, so I only sipped water with my GU Roctane that I brought with me, and around mile 19 there was one with GU Gel and lots of different flavors for runners to take. Plus the “unofficial aid-stations” setup by locals — some were cooking pancake and bacon on a griddle, BBQ, gigantic local grown strawberrie..etc; it’s so tempting to stop and have the pancake in this chilly morning! The sun unexpectedly came out, but not too hot yet – just your beautiful California weather and what a difference after gloomy Paris. When I saw the Hallelujah at mile 26, I started sprinting and mentally checking off runners one by one; soon I crossed the Finish line and got my beautiful medal. I crossed the finish line with two Full Marathon runners and that told me they were FAST! One of them was saying that he wasn’t too happy with his time, so I had to ask how he did. “A littler over 2:30” he said, oh right THAT’s very slow (eyes rolling)!! It probably would have been my time if I had run an Half Marathon that day, with all the stops for pictures. I congratulated them both, handshakes, names exchanges, pictures taken and emails exchanges..etc. They are the fastest runners I personally know besides Shinji now. I don’t think Michael and Marcia finished their Relay yet, so I took my time exploring the Finish Village. First thing first — grab a cold beer at the beer tent, and got that bag of sandwich, fruits cup, protein bar..for finishers, and the sun felt so nice and warm on my face while I waited for my running buddies finishing their runs. Spotted a guy with “Gatorade” shirt, so couldn’t help but to ask “are you sponsored by Gatorade?” No, he just really liked free t-shirt. Aha, that’s interesting. I actually wear my GU shirt and hat proudly, not only because they sponsor me races and products, but I really like the products and the science behind them as a matter of fact. And one thing I do quite often at races now is proudly introducing myself as the GU Crew Athlete and telling people about the products I use, the new flavor, and what upcoming races GU is sponsoring since I have a mental calendar with all the race dates and locations in my head now! I probably can come up with a PowerPoint and easily deliver a speech, aha.. job hazard I guess. I am just truly enjoying this whole new experience of running THE races and meeting great runners now, and gratefully say that I am one lucky girl!